Close to the heart of downtown Troutman, full brick Ranch/bsmt home enjoys front yard views of Troutman Middle sporting events, or lounge by the above ground saltwater pool in fenced backyard! 3 BRs on main level incl Master + 4th BR & 3rd full BA in bsmt. Rooms inside for every need. 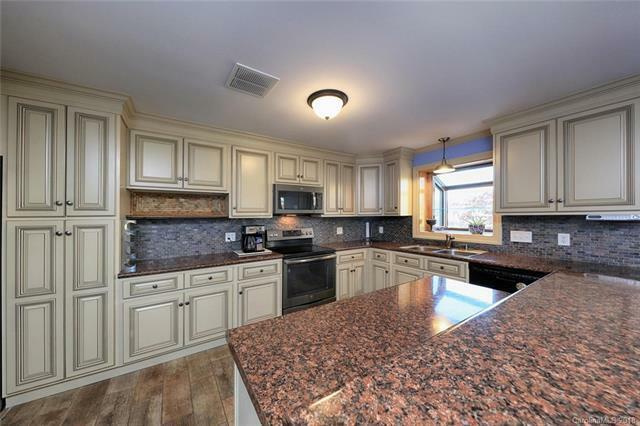 Kitchen opens to GR w/lg brick hearth for sitting by the FP across from picture window views of front yard & school field. Great storage, an eat-in island & updated appliances accent kitchen. Around the corner, dining space adjoins a LR, with sunny views across backyard & patio. Window-wrapped Sunroom has separate access to front yard. Newer windows, 2009 Roof & Heat Pump, plus a whole house fan. Lg partially finished bsmt (unpermitted) offers a 2nd gas FP, large Rec space, sink for kitchenette option, 3rd Bath, utility room w/outdoor access, a spacious BR w/walk-in closet, + deep 1 car garage. Outbuilding w/power & security. Three-quarter acre lot, patio, pool & 2 car detached garage w/backyd access.